After consulting with his mom, I decided to go with a Star Wars theme for my godson’s First Communion cake. But before we get to that, you should know that inside the cake I was going for something Strawberry Shortcake style, but that would hold up to a long drive and warm weather. So I opted for Martha Stewart’s White Butter Cake with vanilla buttercream and strawberry preserves between the layers. It was delicious, but next time I make the cake I will definitely add some kind of simple syrup to help moisten it a little bit more. I scouted for quite awhile to figure out what to use to make the cutouts and which characters to include. 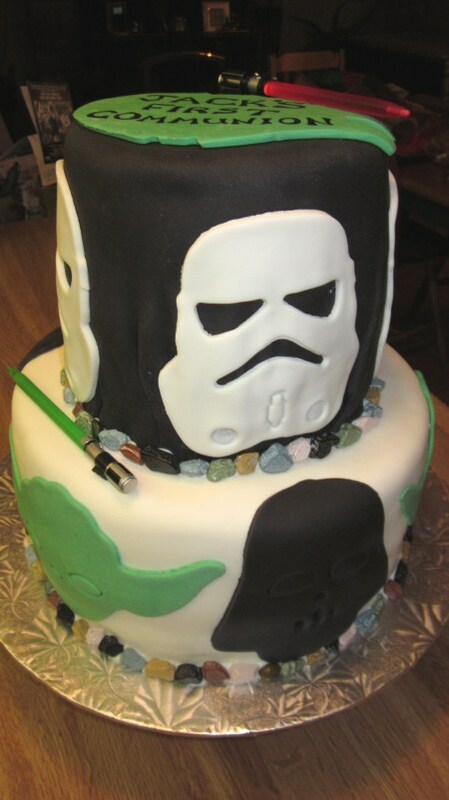 Initially I thought of making a whole R2D2 cake like this one, but I don’t think my sculpting skills are quite there. So you can see below how everything started. I used the molds to cut the shapes from the coloured fondant, trimming with a small paring knife, then I just used water to glue them to the sides of the cake. 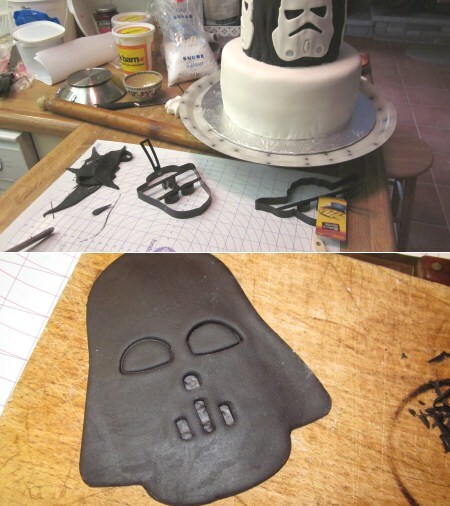 Making cutouts for the Star Wars cake. Figuring out the placement was probably the toughest part, but I think it worked out in the end. I put a Millenium Falcon cutout on top and edible marker for the writing. I then used candy-coated chocolate rocks to trim it, hoping to mimic the rocky desert landscape on Luke Skywalker’s home planet of Tatooine. The finishing touch was a couple of mini lightsabers (actually Nintendo DS styluses). And all that mattered, was that my favourite little guy loved it! OMG this is amazingggg Jack must of loved it!!!! Congrats to you for cake after cake amazing!